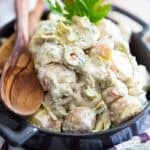 Creamy potato salad with artichoke and green olives, brought together by a delicious creamy dressing. The perfect companion to your grilled meat or sandwich! Cook the potatoes until fork tender in plenty of salted water, then drain them and let them cool completely to room temperature. You can put them in the fridge to speed up the process. Meawhile, prep the other ingredients and make the dressing. To make that dressing, combine all the ingredients in a mixing bowl and whisk vigorously until well combined. Place the cooled potatoes, artichoke hearts, green olives, celery, bell pepper, Parmesan cheese and flat parsley in a large bowl. Pour the creamy dressing right in and give everything a gentle toss, until well combined. Serve immediately or refrigerate for a few hours to allow flavors to meld. Leftovers will keep in the refrigerator for up to a few days.